There’s certainly no shortage of debate around battery electric commercial vehicles as a viable alternative to traditional diesel, alternative fuel, and hybrid powertrains. Technology is not ready vs. BEV technology is proven and ready right now. Charging infrastructure is not ready vs. Trusting the market to provide BEV charging solutions. Charging Infrastructure is not fast enough vs. Trusting the market to provide BEV charging solutions. The electric grid cannot support growth in electric vehicles vs. The grid and market will evolve with BEVs. Maintenance will be more costly vs. Maintenance may be less costly. Vehicle purchase price is too high for a positive ROI vs. BEVs will be competitively priced. Vehicle operating costs are too great for positive ROI vs. BEVs will be less expensive to operate. Vehicle residual value is questionable vs. BEVs will command a premium at resale. Vehicle life is too short vs. BEVs will last beyond 10 years. 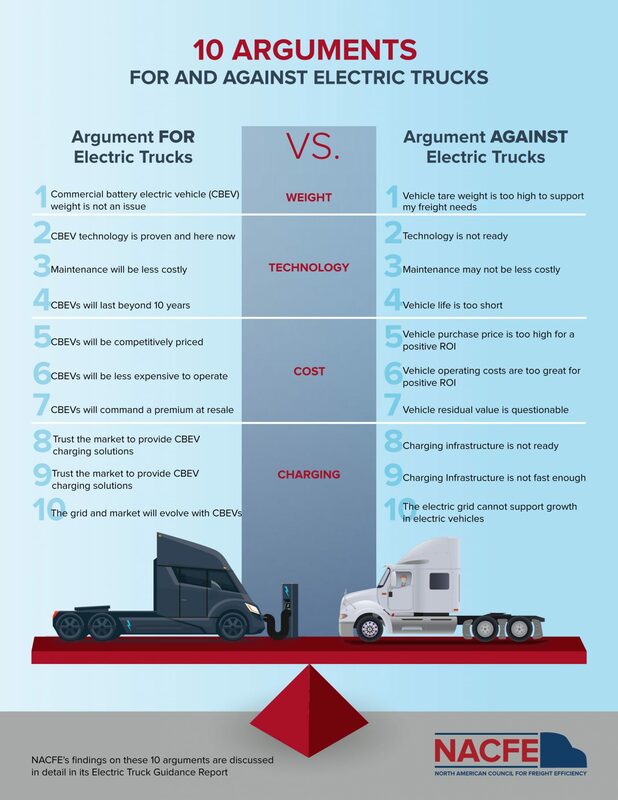 Vehicle tare weight is too high to support my freight needs vs. BEV weight is not an issue. As you navigate through your decision making process, just remember there is no one right way for a fleet to establish a CBEV strategy. Today’s fleets are currently using a mix of diverse technologies in their operations and we don’t foresee the future to be that much different. What we know for certain is that battery energy density is improving at a rapid pace and will spur increases in BEV efficiency that likely cannot be matched by evolutionary changes to the internal combustion engines. The transition of CBEV’s into fleets will happen over many decades to come, and will share space with traditional gasoline, diesel, and also other emerging technologies like fuel cells, alternative fuel powertrains, and hybrids. Trucking represents a complex industry filled with varying operating processes and business cycles. For a fleet to demand a singular yes or no answer on whether CBEVs are right for them, simply isn’t realistic. We encourage all the fleets and carriers we work with to constantly look for ways to improve the way they operate.